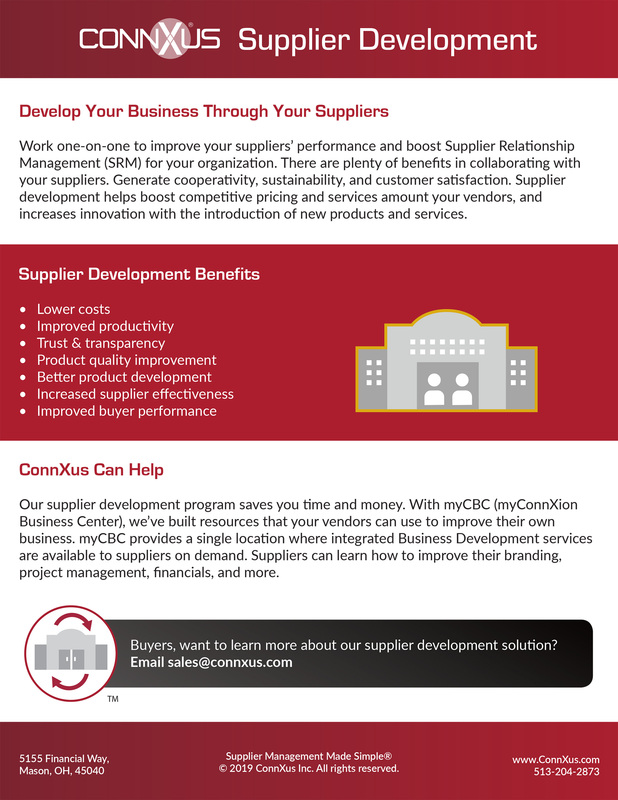 MASON, OH - “As an innovator in the Supplier Relationship Management (SRM) space, we’re thrilled to announce the launch of our new supplier development program myConnXion Business Center (myCBC) and the new ConnXus Verified & ConnXus Certified programs” says Daryl Hammett, COO/GM. Along with two new partnerships, we continue our commitment to excellence, delivering resources to help you grow your business. 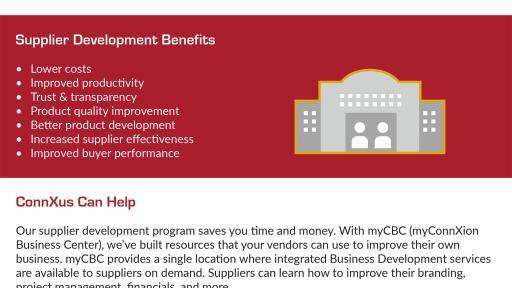 myCBC helps businesses of all sizes and diversity status prepare for the right buyer opportunity. 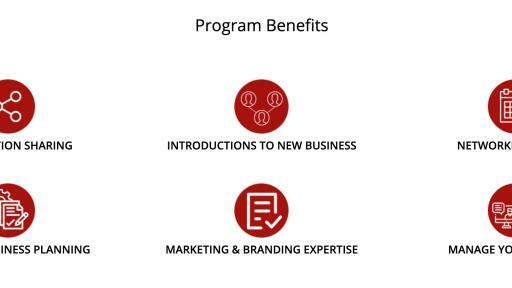 With our network of affiliates and a robust knowledge base, we can help you improve your branding, project management capabilities, financial know-how, and more. Our in-person events & upcoming online webinars provide great opportunities for networking and development. Buyers have become more attuned to mitigating supplier risk. Our Risk DeteXion product allows organizations to quickly and thoroughly vet potential business partners. For suppliers, we offer Risk Scorecard , a high-level supplier financial risk assessment that benchmarks your risk score against the industry standard and helps you stand out from the crowd. Our new partnership with SecurityStudio brings the power of FISASCORE to your fingerstips. FISASCORE is a self-assessment tool that analyzes your company’s security standards and provides an estimate of your security risk. Trusted by companies large and small, FISASCORE uses industry standards to identify vulnerabilities, control gaps, and threats to your organization’s administrative, physical and technical controls. The end result is a score from 300 to 850 that can be used as a standard way to easily communicate your organization's security to potential buyers. With the integration of SecurityStudio solutions, we enable you to get your score, find your company’s pain points, and get a security action plan all within myConnXion. SecurityStudio Inc headquartered in Minneapolis, is a SaaS-based product company that provides a holistic integration platform for the information security industry and builds software tools to help organizations measure and improve their information security programs. FISASCORE™, the flagship product, assesses the physical, administrative and technical controls of organizations. It generates a quantifiable risk score and report with recommendations on how to improve information security. VENDEFENSE ®, a third-party risk management work-flow and automation tool, helps organizations measure and manage third-party and vendor security risk.